The Skinny: Popular Singaporean filmmaker Jack Neo tries his hand at horror, albeit with a comic twist, in Where Got Ghost?, a Tales from the Crypt-style “ghost story” anthology with a decidedly local flair. While real scares are few and far between, the comedy and the film’s insights into Singaporean culture make it a worthwhile, if somewhat slight affair. Review by Calvin McMillin: In the last ten years, we’ve seen a number of horror anthologies on the big screen: the Pan-Asian collaborations Three (2002) and Three…Extremes (2004) are perhaps the most famous; the Japanese turned out the Edogawa Rampo adaptation Rampo Noir (2005); and the Thais have had quite a bit of success with the recent Phobia series. 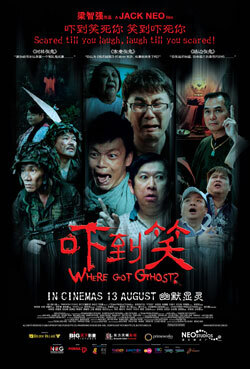 But leave it to the Singaporeans to put a slightly different (although not necessarily original) spin on the horror omnibus film with Where Got Ghost?, a film composed of three tales meant to emphasize the dark comedy often inherent in horrific situations. While Kelvin Tong’s horror-comedy misfire Men in White failed to exploit the thin line separating horror and comedy, Singapore’s premier commercial filmmaker Jack Neo seems like the perfect director to pick up the slack. After all, since his breakout hit I Not Stupid (2002), Neo has practically been king of the Singapore box office, churning out hit after populist hit with few duds along the way. Alongside co-director Boris Boo, the popular director helms three not-so-simple morality tales with an explicitly Singaporean flavor – beginning, of course, with its Singlish-inflected title. The first tale, “Roadside Got Ghost,” revolves around a trio of con artists led by the arrogant Cai (Richard Low). These otherwise no-talent criminals plan to capitalize on the local fixation with the lottery called “4-D” using a simple, if tedious scam. They call every name in the Singapore phonebook and give them “winning” lottery numbers, doling out all possible four digit numerical combination one-by-one. On the phone, they ask for a donation if the person wins. Of course, not every winning participant is willing to give back a commission, so Cai and his cronies make personal visits to collect what’s owed to them...by any means necessary. The scam is going along swimmingly until a mysterious stranger calls Cai, promising some “lucky numbers” of his own. Although angered by someone swiping the scam he invented, Cai can’t resist playing the numbers. And that’s when things get weird. Despite an intriguing premise, “Roadside Got Ghost” is perhaps the least scary film in the anthology, as the stranger’s identity and the segment's Tales from the Crypt-style dénouement are telegraphed from very early on. However, the film is quite funny thanks to a nice comic turn from Richard Low (I Not Stupid, Singapore Dreaming), who infuses his character with a belligerent arrogance and a delightfully foul mouth, resulting in more than a few big laughs. Further, “Roadside Got Ghost” feels less generic thanks to its Singapore-centric plot, offering a bit of veiled commentary on the country’s “national obsession” with 4-D. The second tale is entitled “Forest Got Ghost,” and centers on the plight of two army reservists, Nan (John Cheng) and Lei (Wang Lei). Forced to attend compulsory training exercises, the two older, out-of-shape guys decide to take a shortcut through the woods - which turn out to be haunted. Eventually, they meet a pale, overweight woman (Tay Yin Yin), who just so happens to be strolling around in the same thought-to-be uninhabited woods (in the rain no less!). The men seem convinced she’s a ghost, but considering the horrors that have been chasing them, they’re willing to take the risk, entering her house to seek shelter from the storm. Is she a ghost or isn’t she? The boys find out in a finale that seems tonally distinct from everything that came before. Story-wise, “Forest Got Ghost” is probably the weakest, as it basically amounts to a number of strung together “scary situations” that culminate in a finale that is far darker than you might expect. However, those “scary situations” are quite hilarious thanks to the film’s oddly likeable, if cowardly protagonists. The dynamic is pure “buddy comedy” stuff, giving this short tale an Abbott and Costello Meet Frankenstein vibe that mixes horror and humor to great effect. Having said that, the segment that takes place in the woman’s house isn’t quite as amusing as the earlier portion of the film, as Nan’s out-of-nowhere lechery and his numerous fat jokes at the woman’s expense are both tedious and unnecessary. The third and final tale in this trilogy of terror is “House Got Ghost,” which turns out to be a sequel/epilogue to Jack Neo’s Money No Enough 2 from 2008. That film focused on the money problems of three brothers, and this short tale picks up (spoiler alert!) about a year after the death of their mother. The premise is simple: during the Seventh Lunar Month, dear old mom (Lai Ming) returns to haunt her three sons (returning actors Jack Neo, Mark Lee, and Henry Thia). “House Got Ghost” perfectly melds horror and comedy, as each jolting appearance of the mother quickly results in a big scare followed by a big laugh. The film is essentially a mystery: why is the mother haunting them? While Henry Thia’s character is the most filial son, the other two have neglected their mother, largely because they are resentful that their prayers to her haven’t resulted in any good fortune. However, the boys are about to get a lesson in filial piety from beyond the grave. “House Got Ghost” is probably the most polished and consistently enjoyable of the three stories, but its moral is also the most problematic. In fact, all three aren’t exactly the clear-cut morality tales they seem to be. “Roadside Got Ghost” is essentially about the dangers of cheating others, and yet Cai isn’t being pursued by supernatural forces because of his lottery scam. It’s actually due to an infraction that he didn’t personally (or knowingly) commit. Similarly, “Forest Got Ghost” seems to be saying, “Don’t take shortcuts in life,” but does the punishment in that film really fit the crime? Whereas those old EC horror comics like Tales from the Crypt emphasized “just desserts” for people who did truly bad things, Where Got Ghost? seems to be warning its viewers that any bad behavior could be paid back one-hundredfold. Seeing that this movie was made in a country that outlaws chewing gum, I think there may be something deeper going on in the film’s morality.